Last year I made a quilt about my depression called Silent Scream, and started working on a second. It was a cathartic exercise and made me feel happy whilst I was making them. Fast forward 6 months or so and I'm feeling good. The depression is in remission. My mental health is the best it's been for years. I'm happy. Time to make a quilt to express that. It is now my belief, and that of my family and friends who can't believe the change in me, that my marriage was making a huge contribution to the depression. Now I'm free. Now the future is mine. This is a lyric from She Bangs The Drums by The Stone Roses (if you don't know them, go and have a listen on Spotify, you won't regret it!) and sums up how I feel perfectly. 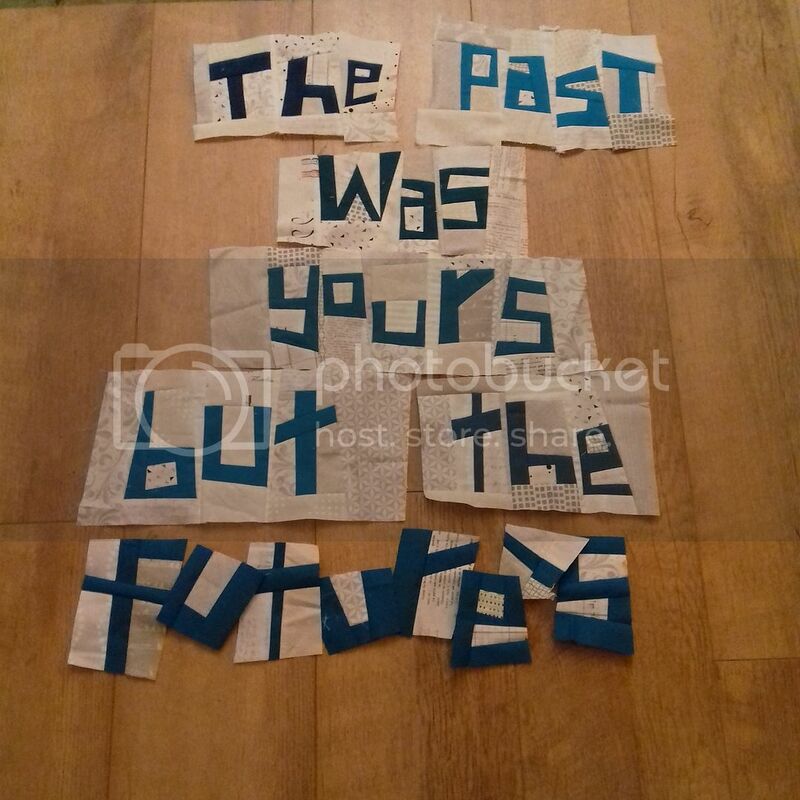 It is improved pieced using various shades of blue for the words and a low volume scrappy background. 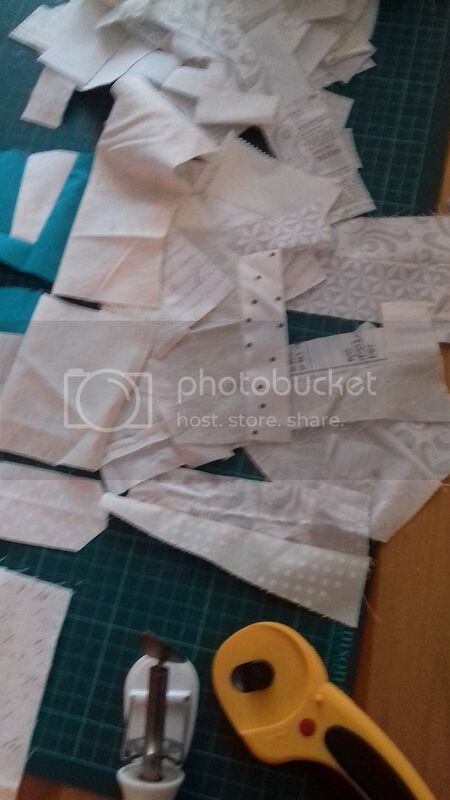 I've also been sewing together scraps of low volume to help make the background around the words. It's now time to start putting it all together. 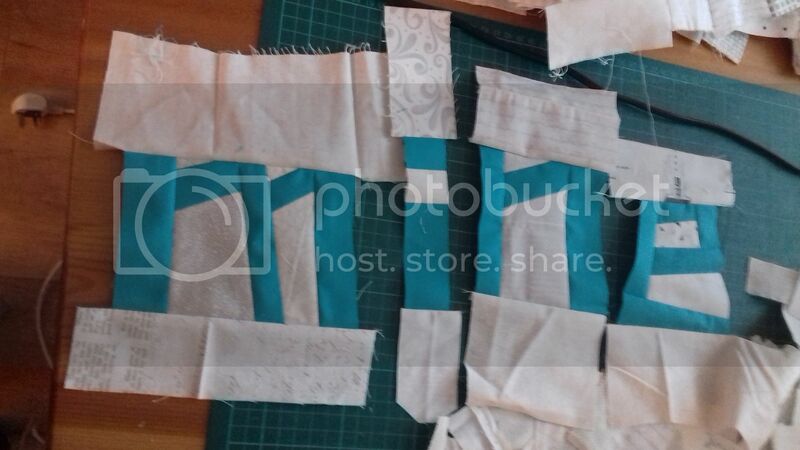 I really enjoy this method of patchwork. This rather blurry photo shows the tools of my trade. 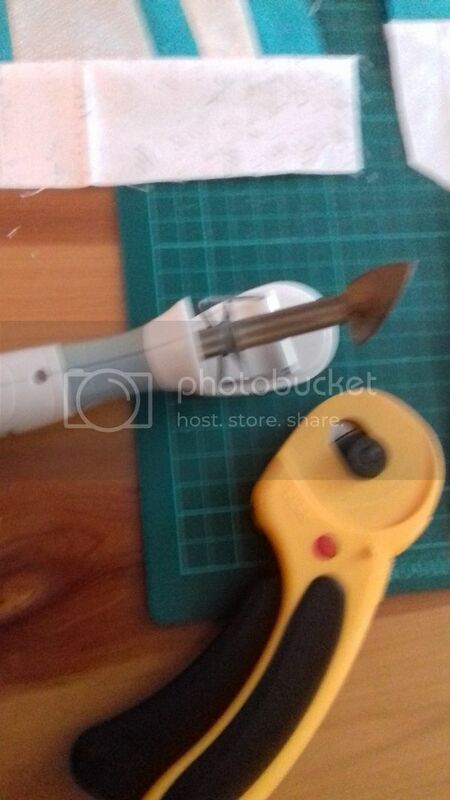 To the left of my sewing machine (I'm left-handed) is my cutting mat with my rotary cutter and my mini iron, essential for flattening all those seams, I'm pressing them open to reduce bulk. If you haven't tried this technique, I'd urge you to give it a go! Oh, that is such good news! You are certainly sounding better, and it's great to know that it's because you are feeling better! Oh! I'm so glad to hear you're doing better! This kind of making looks like it's very therapeutic. This is the best thing I have read all week, I am so glad you're in a more positive place, after the year you've had I'm not sure I would have been as strong as you. That's great news...I'm so happy for you. Looking forward to seeing your finished quilt. So pleased to hear you are in a better place. It sounds like this project is just what you need. Great project! Glad you are feeling better. I love this so much - go out and grab your future with both hands! Fantastic, both about your mental health improvement and also such a fabulous quilt! it's great to hear you're feeling positive and getting back to crafting with a vengeance! What a lovely uplifting post Wendy, so pleased to hear that you are feeling brighter. Your quilt is going to be brilliant - love your improv lettering, I must try it - just need to find a quote I like enough to immortalise it in fabric! Can't wait to see this finished and where you will place it. You've created a great motivator for yourself and your future. Go Wendy! What a marvellously positive post Wendy, the future is most definitely yours for the taking!